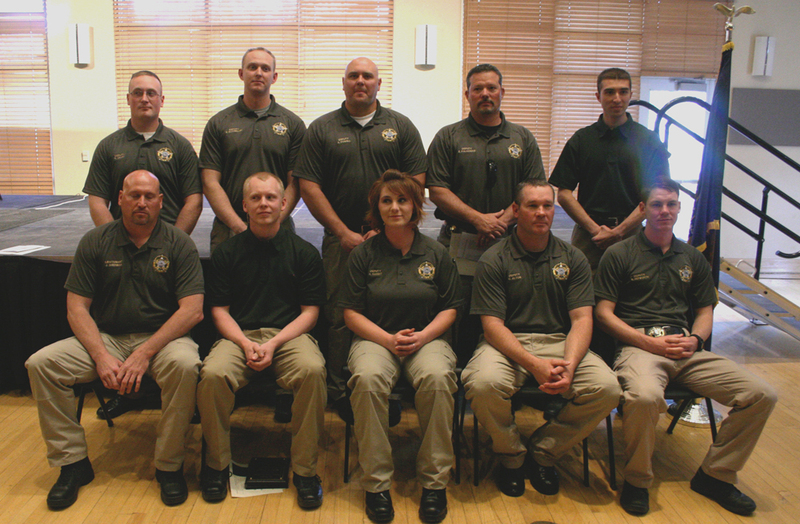 The first graduating class from Utah State University Eastern’s Law Enforcement Academy (LEO) and Basic Corrections Academy (BCO) celebrated their graduation on April 8, 2015, in the Jennifer Leavitt Student Center. Among the 12 graduates, seven were graduating from both BCO and LEO, and five were graduating from LEO. Officiating the ceremony was their Director Scott Henrie, Sheriff Jeff Woods, Vice Chancellor Peter Iyere and Chancellor Joe Peterson. The graduation consisted of speeches given by Director Henrie and Captain Kelly Sparks, deputy director of the Peace Officer Standard and Training (POST) Academy. Awards were given to the graduates for physical fitness, superior fitness, academic achievement and, shooting the heck out of the range. One of his ending points was the poem “A Soldiers Prayer.” He said, “Cadets, move forward with courage, and may God bless you all.” The rumbling of the cadets voices when they recited their code of ethics made an eerie echo throughout the JLSC as they stood their tallest stance. Henrie said the group started out as eight students, all of which were eager, young and enthusiastic for the chance to dedicate their lives. After multiple trials, and one ethics and integrity class, the group lost one of their numbers and was then down to seven. The graduation ceremony had 11 attending, with one unable to attend for a total of 12 graduating cadets. Among these were Kenneth Casey Alton, Erik Buchmiller, Ryan J. Crary, Andrea Haight, Nathan E. Hepworth, Zachary H. Palocios, Richard O. Pendleton, Michael Ray Perry, Aaron M. Powell, Justin W. Sherman Derick Anderson and Meranda Rose Turner.